I grew up with occult books, paranormal fairs, psychics evenings and a mom-healer. From the time I was 8 (1974) I always went along with my mom who worked on the fairs as magnetizer/healer. Apparently she did a good job because they made a documentary of her which was also shown in every university in The Netherlands. We always had a lot of people at our house who were always coming back for one of her consults. Even 40 years later they still phone my mom for an appointment although she now doesn’t even work anymore. Still people are desperate for one of her healing sessions; or they still knew her from way back or they got a tip from someone else who knows her. 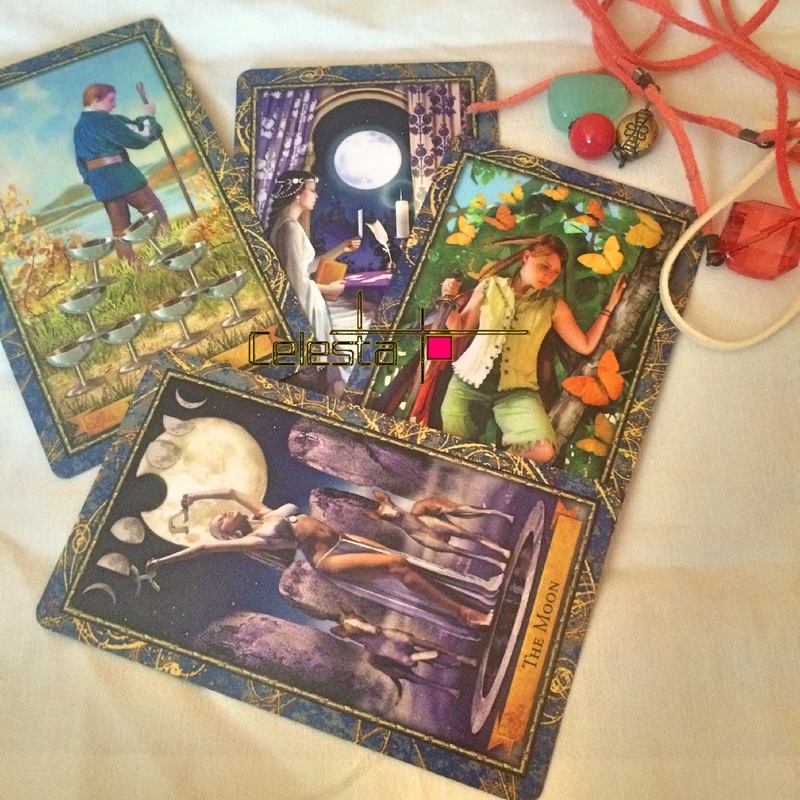 I didn’t find Tarot interesting…..
As I wrote in my last blog when mom was working at the fair I walked around the fair all day to check out all the different psychics. I intentionally skipped the Tarot stands because at that time I didn’t find Tarot interesting yet. Scanning psychics passed into scanning the passant people around the fairs I was walking at. At the time I wasn’t even aware of doing that, but I realised this 30 years later. When I looked at people I instantly saw what whas going on in their lifes/heads. I noticed if they were sad or saw in my mind how they looked like and how they felt when they were little. I could feel their emotions but at that time I didn’t realised that. It was just a normal habit that occured whenever I saw or met people. When I was 18 (1984) my mom asked me to join a psychic workshop together with her given by a very good psychic. We already knew the man for years since we always went to the psychometrics evenings with various psychics. This particular psychic was very good in telling people all kinds of accurate facts about their lifes. I remember one evening he said to a random woman in the public: “you broke that blue vase today didn’t you”. With a lot of astonishment the woman confirmed the unfortunate happening earlier that day. He possibily couldn’t have know that because they didn’t knew eachother and hadn’t met before that evening. I was very stunned and impressed too by him and during a lot of other sessions when he did read me myself. He said a lot of accurate private information which were often totally correct. Notice that I write ‘accurate’ because I think a psychic is only very good if he isn’t vague in the information he gives. Information in which he nails down all the facts just as they are and he doesn’t talk nonsense. One day in the week we went to this workshop where this psychic taught us how to do psychometrics and how to develop our psychic abilities. At this time I didn’t realized that I already had some supersensible skills, but I never experienced this as unusual or abnormal. I thought everybody else had that kind of experiencing too and that it was part of the human nature. Well this last statement is actually true, but apparently not common for most of the people. With regard to my own family, both my grandmother and her mother had both psychic skills. Beside my mom who was healer and clairsentient; my grandmother was always very perceptive and her mother actually saw diseased people when she walked down the streets. Both lived their lifes in total suppressed feelings; they hardly talked about it and obviously passed it on to me. When I was a kid and teenager I often had very predictive dreams and I was very clairsentient too. Although I liked our mystic trips, fairs and evenings very much; it was not really my intention to become a psychic of some sort in my life. I had other ambitions, but did go to the workshops for fun with my mother. My mother has a bit of a scallywag reputation all her life and I can be occassionally far from serious myself so we had a lot of crazy fun together. The workshop evenings all started with a short meditation exercise on a piece of music. This music was AveMaria; a music clip which I didn’t (and still not) like very much. All participants were sitting there with their eyes closed to ground and relax except me. I was observing everybody else because I didn’t have the patience and calmness to meditate and relax for just five minutes (at that time). But nobody noticed and we continued the workshop. This workshop consisted of short psychometrie exercises; everybody had to make a personal object available for the others. And then everybody had the chance to train his or her psychic ability. The first time it was my turn I got a necklace from one of the other participants; a young woman but at the time 10 years older than me. The piece of jewelry looked very unusual and not common like other necklaces. The intention was to take the jewelry in my hands, to close my eyes and to wait for hunches to come in. I did that and received some images in my mind. In front of the whole group I had to do this psychic reading which was very awkward to do because I had the idea that I was only going to speak total rubbisch. So I began saying what my mind just received when holding this pendant. I said I didn’t received that much information; the data I got was none of meaning and quite too little to mention I thought. Well regardless of what I was thinking I had to mention my findings anyway the master himself thought. With some skepticism for my own psychic findings I mentioned that the first thing that came to my mind was a tall and slim very dark coloured man with very short frizzy hair. Further there was a very very fast flash of a little (half black/half white) girl that went through my mind, but I did’t mention that because I thought it was just my imagination. So I told them the man was the only thing I had seen. Now it was time for the woman who owned the necklace to react on the for me useless information or rather psychic info. She started by saying that it was possible to open the pendant hanger in question. I was very surprised because I hadn’t noticed that you could open the piece of jewelry. I opened it and saw a photograph of a little girl; she had a medium dark skin. I wasn’t very surprised about this girl, but then the woman told us that her husband was this very tall and slim man I had seen in my mind. I need to mention here that at the time black people weren’t very common in our west European country. So it wasn’t that logic that I had seen that vision. The people sitting around our workshop table were all very enthousiastic about my psychic vision and I sat there in total unbelief and was telling myself that it was just coincidence. After they were telling me how good they thought my effort had been, I told myself immediately that this would be the only occassion this psychic try happened. I instantly created some sort of psychic anxiety for myself and the rest of the following workshops. I just went there for the sociability and fun and from then on blocked any psychic abilities on purpose. In one of the next blogs I will tell you how my life went while fighting against these psychic abilities.